N Scale DPM Gold Series Woods Furniture Co. These are easy to construct , injection molded, plastic kits , with great detail. 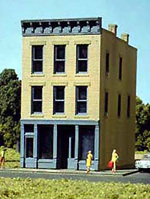 N Scale DPM Goodnight Mattress Co.
N Scale DPM Gripp’s Luggage Mfg.